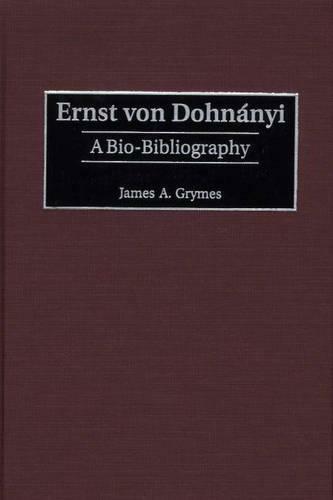 As a result of both his political reputation--destroyed by false charges of Nazism after World War II--and his rejection of avant-garde techniques, the recordings and compositions of Ernst von Dohnanyi went largely ignored for most of the 20th century. In recent years, however, musicians have begun to revise their interpretations of 20th century music to include compositional and performance styles that, like Dohnanyi's, adhered more closely to 19th century aesthetics. Although performers and audiences worldwide have started to rediscover his musical legacy, scholarship has not kept pace with their growing interest. This bio-bibliography corrects that. As the first scholarly examination in English of Dohnanyi's life and work, it serves as the perfect introduction to an unfairly neglected 20th century artist. A brief but insightful biography is followed by a list of works that reflects the most current research of Dohnanyi's creative output. It includes nearly 200 entries, each of which collects such information as the date of composition, the instrumentation of the work, the publisher of its first edition, the location of the manuscript, and the date and location of its premiere. The discography lists 400 sound recordings of the composer's work, and the annotated bibliography includes 500 entries, emphasizing performance reviews that offer substantial information about Dohnanyi's works and style.